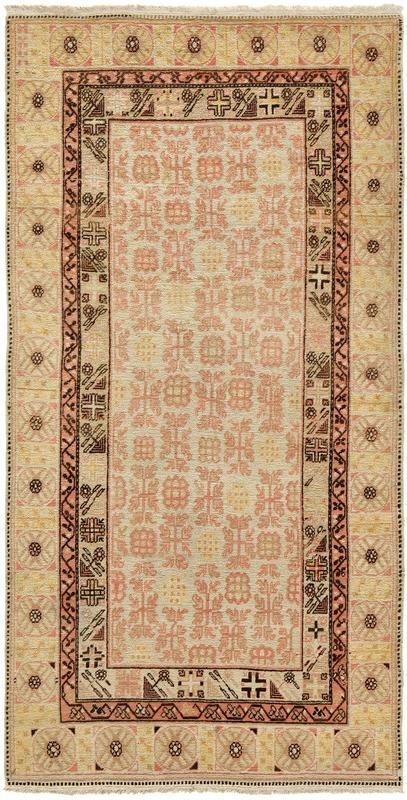 4' 5" x 8 '8"
Khotan - 4' 5" x 8 '8"
Antique Khotan carpets are often closely related to classic Chinese rug design, although some like this charming example preserve the distinctive Silk Road idiom of East Turkestan. Here stylized shrubs, fruits, and rosettes in mauve and pale saffron repeat in staggered alternation across a soft tan field. Minor borders with highly abstract shrubs, rosettes, and vines-scrolls frame the field, enclosed yet again by a larger main border of rosette medallions. The consistent use of a neutral tan ground everywhere except the out minor border endows the rug with an appealing decorative unity.